REDONDO BEACH, Calif. — NASA's James Webb Space Telescope is one of the most intricate and powerful observatories ever devised. Almost immediately after launching into space in 2018, James Webb Space Telescope will begin the slow process of unfolding from its clamshell configuration into the most sensitive infrared instrument of its kind yet built. The telescope will then begin peering deep into the cosmos for signals left over from the Big Bang that created our universe. But JWST's nail-biting deployment won't be the first time the craft unfolds. Before constructing the final components, engineers have been making sure to test and retest mockups in conditions potentially harsher than the telescope — the long-awaited $8.8 billion successor to NASA's iconic Hubble Space Telescope — will experience. Each piece is identical to the final product. The pieces of the giant telescope are exposed to the some of the worst trials engineers can come up with. The mockups must perform not only in ideal circumstances, but also in subpar conditions. "You don't just test how it's going to work the way it's supposed to work," Scott Willoughby, JWST's program manager at Northrop Grumman, said during a Jan. 11 tour of the company's facility here in Redondo Beach. The jet-sized telescope isn't being built all at once, but instead incrementally, allowing for testing of the individual parts. "You don't built it all and see if it works," Willoughby said. The first priority has been high-risk objects such as the mirrors and the instruments. JWST contains 18 hexagonal mirrors in an array, rather than one large mirror. The smaller mirrors allow for more precise construction. The separate pieces also travel more easily into space; although 12 sit on the center mast, two three-mirror panels unfold on each side as the telescope deploys. Made of beryllium, the small mirrors are less apt than one giant one to change their shape in the extreme temperatures of space. The final mirror will be equivalent to a single reflective surface of 21.5 feet (6.5 meters), with a collecting area almost five times larger than the primary mirror of the Hubble Space Telescope. Each mirror is covered by a thin coat of gold to enhance its reflectivity — a very thin coat, Willoughby stressed. "You couldn't take all of that gold and make a wedding ring," he said. Although Northrop Grumman is the primary contractor, the mirrors themselves have been subcontracted to Ball Aerospace, which has subcontracted out various elements. "It takes a village to build a mirror," Willoughby said. Construction of all18 segments of the primary mirror was completed last year. JWST's instruments, which are being assembled by NASA's Goddard Space Flight Center in Greenbelt, Md., and the European and Canadian space agencies, should be ready by the end of this year, officials have said. The largest part of JWST is the five-layered sunshield, which will shield the telescope from temperatures of up to 185 degrees Fahrenheit (85degrees Celsius) on the sun side. The primary telescope must remain at temperatures below minus 370 degrees Fahrenheit (minus 223 degrees Celsius) so that it can register faint infrared emissions from distant sources. Each layer of the tennis-court-size sunshield is filled with over 10,000 seams, which allow it to take a 3D shape rather than remaining flat. The five layers are either 0.001 or 0.002 inches thick and resemble the surface a giant mylar balloon. Three of the five have already been completed, with the last two set to be done by the end of the year. The sunshield blocks heat not only from the sun, but also from the body of the observatory. Almost 10 feet (3 m) in diameter, the body, known as the bus, houses JWST's instruments and power supply. The electronic equipment emits heat that can inhibit astronomical readings just like the sun. The bus is "the heart of anything that goes into space," Willoughby said. Construction on the bus only recently started, although the space-ready mockup has already undergone a number of tests. Almost immediately after it leaves Earth's orbit, the James Webb Space Telescope will begin its deployment process. The outer layer, which protects it from the heat of racing through Earth's atmosphere, will drop off. The wings holding the sunshield will unfold, and the shield will begin to spread to full capacity. The secondary mirror will extend, and the two panels on the primary will emerge. "We will actually stretch out as we're flying," Willoughby said. The entire process will take roughly two weeks and will happen while JWST is speeding toward its final destination, a gravitationally stable spot 900,000 miles (1.5 million km) from Earth called the sun-Earth Lagrange point 2. "The Mars [rover Curiosity] had seven minutes of terror," said JWST scientist Heidi Hammel of the Space Science Institute in Boulder, Colo. "We're going to have seven days of terror." According to Hammel, the most nerve-racking part of the deployment will be the extension of the smaller secondary mirror. Any problems that may develop with the sunshield or engines will still allow for some limited science to be performed. But "if we don't have the secondary mirror, we don't have a telescope," Hammel said. Despite the intricate nature of the deployment process, Willoughby said he's confident of success, citing the many tests that will prove out each component and procedure, along with Northrop Grumman's track record. "Northrop Grumman has a 100 percent success rate in deployment," he stressed. 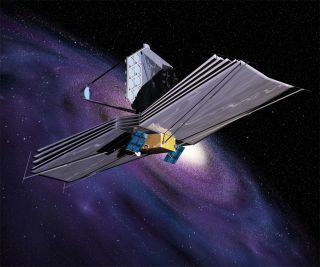 Although JWST will go through a significant unfolding, it won't hold the record for a Northrop Grumman-built satellite. According to Stuart Moses, who works with science and weather systems for the company, that honor goes to the Tracking and Data Relay System (TRDS), an array of six satellites launched in 1983, which was recognized for setting a record after operating for 25 years. "TDRS has more deployments, just in terms of numbers," Moses said. Northrop Grumman has helped in the construction of a number of satellites and space telescopes, including NASA's Chandra and Compton Gamma Ray observatories. "A lot of the deployment technology that we've been using over the decades has been applied to JWST," Moses said.